This cozy nautical cottage is located on a large, secluded, wooded lot about halfway down the Ft Morgan peninsula. The shady moss covered oaks in the back yard give way to a lovely view of Mobile Bay . Relax on the large screened porch or take a short walk down to the Bay. 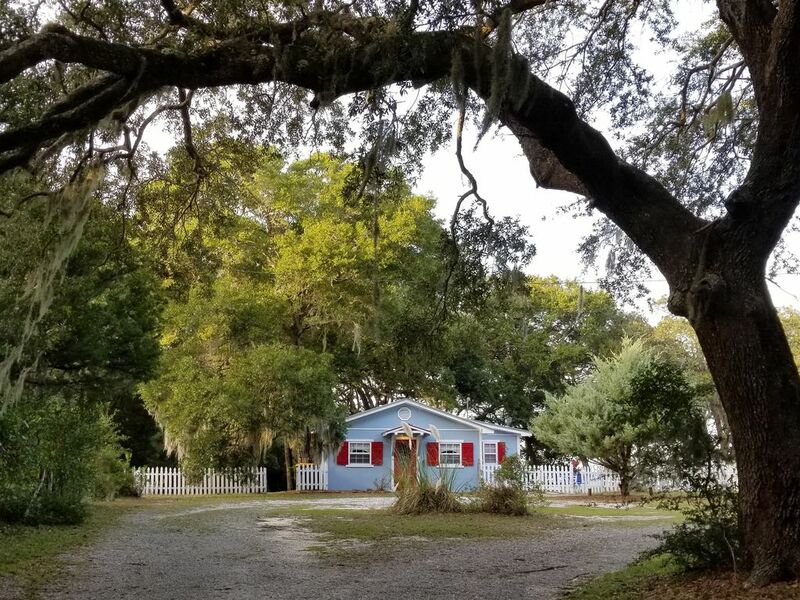 In addition, the cottage is located only two miles from the Mobile Street access to the Gulf of Mexico where there is free parking and a boardwalk over the dunes to soft white sandy beaches that are perfect for swimming, fishing, walking or shelling. Neat, clean, attractively decorated, and recently renovated! Fishermen will love having room to park their boat and the short distance to public launching. Charter fishing close by. Golfer's Paradise: Who could ask for more than a beach house and top of the line golf courses! The Peninsula Golf Club is located just four miles East. It features 18 holes, a pro shop, and restaurant. In addition you will find tennis courts and a swim fitness center. If you want to change things up a bit try the 36 holes of Pure Palmer Golf at Craft Farms, Cotton Creek, and Cypress Bend just an 15 minute drive away. Want more? Play Kiva Dunes or the Golf Club of the Wharf; both are just five miles away. Fishermen welcome: For avid fishermen who want to bring their boat to the beach but avoid the high cost of properties with piers and docks, this cottage is perfect. The large yard has room for parking a boat and a public launch is just minutes away. The Shell Banks Reef is just out in front of the property for great bay fishing. For those wanting to fish the Gulf of Mexico, a launch a little further down makes getting into the gulf a short and easy trip. Don't have a boat? Charter fishing services are close by. What could be easier! Enjoy the City's recreation and special events: The City of Gulf Shores has a fantastic recreation center with daily, weekly, or monthly rates. It features an indoor temperature controlled swimming pool, basketball courts, fitness room, indoor track, ping pong and pool tables, water aerobics, yoga and other fitness classes. In the winter the city's Special Events Department sponsors an outstanding series of performances. A native of Mobile, Alabama I grew up on two shores spending many days as a child on Pleasure Island and then traveling back and forth on summer days and weekends as a teen and young adult to bask in the sun on the white sandy beaches of Gulf Shores. In 1990 I bought my home on Little Lagoon in Gulf Shores where I raised my family while teaching high school in the area. Now, after retiring from nearly 30 years in education I manage rental properties and sell real estate enjoy inviting others to share the pleasures of the island and the Ft. Morgan peninsula. This house is one of several I rent to guests from around the world. Some I own and some belong to friends and neighbors. I have made many friends and always enjoy making new ones. It is my pleasure to see others enjoy a relaxing vacation in a home that is just right for them. As a licensed Alabama Realtor with Exit Realty Gulf Shores I can also assist guests with finding a perfect vacation, 2nd home, investment property or retirement home. I bought this home because of its beautiful yard. The oaks with Spanish Moss, the view of the bay, the serene setting all appealed to me. The home was just a tool shed turned fishing camp then. While it was livable it needed some major updates and renovations which we undertook in 2005. This is the perfect get away for those who want to be away from the crowds or not right on the hot gulf beach. Its shaded screened back porch has a woodsy feel and a view of Mobile Bay. The yard is large and shady and guests can walk down to the bay. It is also only a mile from the Bon Secour National Wildlife Preserve where you find not only a great public beach access but also hiking trails and nature walks. A short one mile drive takes you to the Mobile Street entrance to the Bon Secour National Wildlife Preserve where beach goers will find a vast expanse of sugar white beach along the Gulf of Mexico. Old oks and Spanish moss frame a beautiful view of Mobile Bay. Smoking allowed outside only. We allow small, well-behaved, flea-free, dogs. An additional non-refundable pet fee is required. An increased cleaning fee may also be required. Fenced side yard is perfect for children and pets. This cottage was perfect for our family! The fenced in back yard was great for our dog and the kids loved having WiFi. A wonderful place to come home to after an exhausting day at the beach!! The perfect getaway spot for family and pets! Everyone loved The Blue House. We hope to return for more wonderful times. Beautiful house that was well equipped with everything needed. Loved the screen porch and there was plenty of room for our dog to walk and explore. Fenced I. Yard was very nice. We will definitely come again! This quaint cottage is a vestige of a bygone era when life along the Gulf coast was serene and off the beaten track. It is tucked in a wildlife and bird sanctuary half way between the modern conveniences and resort beaches of Gulf Shores and Historic Fort Morgan set well back from a meandering two lane road. The large screened in back porch overlooks an open grove of ante-bellum oak trees, beyond which is a wetland area and the water of Bon Secour Bay. The only distractions from tranquility are the breezes in the trees, the chorus of songbirds, and occasional brief visit by curious neighboring resident dogs. The furnishings, appliances, and fixtures are more than adequate for a comfortable, enjoyable peaceful stay. There is good cell connection although the DSL connection does bog down at times. The owner was very appreciative of any efforts to help her improve our experience and both she and her husband visited during our two-week stay to deliver some minor maintenance items for the house. Fresh seafood and groceries are readily available for home cooking or there are plenty of good restaurants in both directions from the house. We brought our new rescue dog on his first vacation and he LOVED it. The yard and back porch were perfect for him. The house is just a short drive to a dog friendly beach and a short drive to numerous walking trails. The only down sides were that some of the restaurants in Fort Morgan were closed for the season and the house is a little remote so you do have to drive everywhere. We are already considering returning to this rental house next year. The Fort Morgan peninsula is filled with local flavor and offers unique access to Mobile Bay, Little Lagoon and the white beaches of the Gulf of Mexico (just two miles from the house) The area is great for people who want to be away from the crowd yet close to shopping, entertainment and sports activities. A public boat launch is just three miles away. The Shell Banks reef is just out front for great fishing. The Bon Secour National Wildlife Preserve offers pristine gulf beaches, a wonderful hiking trail and birdwatching opportunities. Three golf courses are within a few minutes' drive. History buffs will enjoy the ruins and museum at Ft. Morgan and her sister, Ft. Gaines, which is a ferry's ride across to Dauphin Island. 1st payment is your down payment on your rental. The full rental balance is due 30 days prior to scheduled arrival date. It will include your damage deposit . If booking an arrival date less than 30 days away, entire amount due at time of booking. A $250* deposit is required to hold a reservation for a week or less, $500 for a month or more. Minimum rental age 25. Dog friendly with fee and approval. Monthly rentals require higher cleaning fee.